Named for San Francisco’s notorious Barbary Coast, the Barbary comedy and variety tent has famously featured the top names in comedy, storytelling, music, improv, and general weirdness. The Barbary’s turn-of-the-century Belgian decor – inspired by the world famous Spiegeltent Victoria – provides a perfect setting for a remarkable line-up of old school (but forward-thinking) variety entertainment. 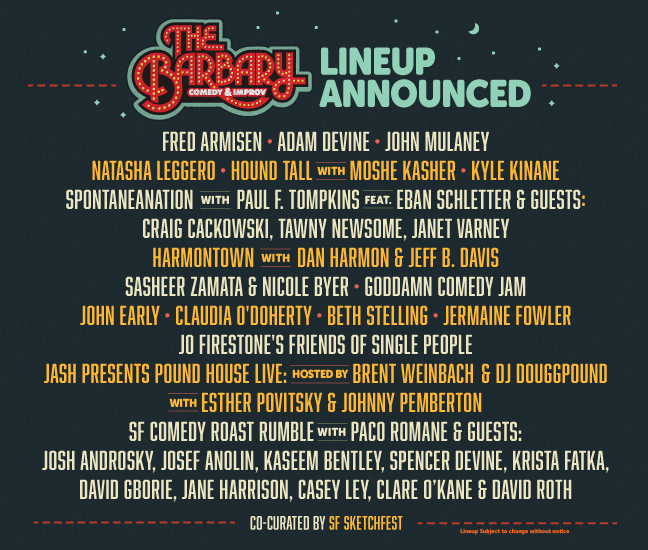 For information about The Barbary’s full lineup, visit www.sfoutsidelands.com/the-barbary.